The decision to retire or not to retire is not yours alone. You must also take into account the feelings of spouses and/or significant others. Spouses and others’ interests must be considered when assessing the personal, and psychological, impacts of your retirement. You may intend to be active in other areas of life, but odds are you will be in the house more, and how that affects others in the home must be considered. A case in point: A client of mine wanted to sell a lucrative estate planning practice, but he and his partner, gentlemen in their 70s, wanted to retain the probate and trust administration segment of the practice. However, the rules of their state at that time did not allow them to sell a practice area. (ABA Model Rule 1.17 has since been modified, and states are continuing to address this modification.) Thus, the partners in this instance either needed to sell the entirety of their practice and leave the profession or allow the one practice area to die of its own weight as time passed. The outcome? Their spouses entered the picture with full force and effect. Having developed their own routines over the fifty years of their husbands’ practice, they in essence told their husbands that they would be “dead” within thirty days if they retired totally. You might think that the wives were concerned about the health of their husbands from what would be the sudden lack of activity. That was not the case, according to my clients. Rather, they did not want their husbands underfoot full time. Some readers may jump to the conclusion that I am being sexist. Please don’t. This is an actual story, which I share to drive home the need to factor in your spouses’ desires along with your own when considering retirement time. 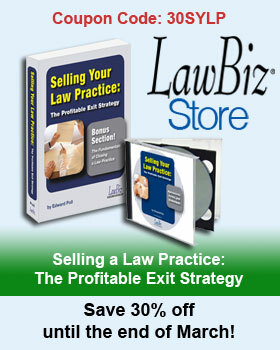 Contact a legal coach at LawBiz to help you plan for retirement. Call today: 800-837-5880.